I read the book “Inferno” by Dan Brown earlier this year. In that book, the researcher who sparks the worldwide search for his creation warns the world about the dangers of over population. 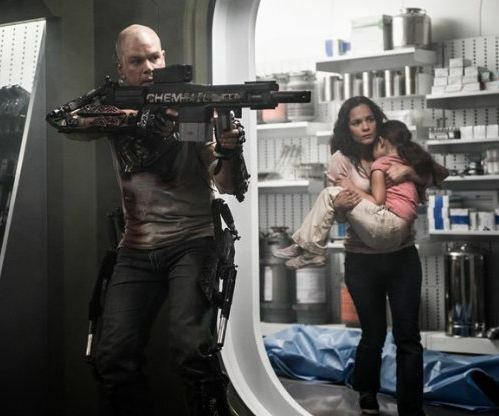 “Elysium” vividly shows how over population can drastically change human nature. The few haves (the rich) live a comfortable life in space while the many have-nots (the poor) are doomed to eeking out a living on a polluted, over populated, Earth. Matt Damon (Max) is one of the few who has a steady job in 2154 Los Angeles. Everyday he goes to work, toils at a menial job, then returns home. Looking skyward when he was a child, Max tells his childhood friend, Frey (played as an adult by the stunning Alice Braga), that he will take her to Elysium (a space-borne habitat) someday. On Elysium life is idyllic. No one dies, there is no disease, the homes are beautiful and the land is lush. Jodie Foster, as Delacourt, brutally protects Elysium from those who try to get there illegally. One day at work, Max receives a lethal dose of radiation. In 5 days he will die. This event changes the course of humanity. It is an excellent thriller / sci fi that is well acted, powerful, gritty, and possibly prophetic. Matt Damon, the wonderful Jodie Foster, Alice Braga, and Sharlto Copley as the extremely scary, Kruger….are all superb. The soundtrack, and special effects, are awesome. Lots of f-words, some gore, some flowing blood. Not for kids or the squeamish. Go to IMDb for more information. We watched this at the Tracy, CA CineMark. Great review Mike. A good sci-fi flick, although it had plenty of potential to be a “great” one.